Tu t'es bien amusé hier soir? Nous nous sommes assis à l'arrière. We sat at the back. Reflexive verbs always use être as the auxiliary verb in Le Passé Composé. Note also that the verb must agree with the gender and number of the person. i.e. taking an extra -e for ladies, and an extra -s for more than one person, -es for multiple ladies. Note that the pronoun me/te/se/nous/vous/se is situated before the auxiliary être. Nous nous sommes déguisés en zombies. We dressed up as zombies. 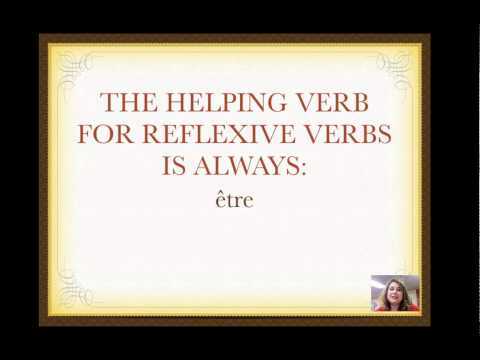 How do we analysis what is reflective verb and auxiliary verb? I don’t understand why “Je me suis bien amusée.” adds the “e” for the feminine subject but “Je me suis lavé les dents.” does not when both speakers are female. It's been a while. Does no one know the answer? Thanks so much for pointing me to the answer, Alan. I understand now but it's getting complicated! :) It would surely help if they'd add a note about it to both those lessons. I did read through all the questions on the lesson I asked about and didn't see an answer there. It should really be part of the lesson, or have a link to a lesson discussing it. In the weekend challenge why does the pp not free: Ce qu'ils se sont déclaré (no s even though they are renewing vows) était émouvant. Could you point me towards the specific challenge you are referring to? How do you tell whether vous is singular or plural ? An example gave "vous vous etes bien amuses?" Whereas the correct answer in the quick Test was "Vous vous etes cache"
"Vous" can be either singular or plural. In this respect it is very much like the English "you". If you use "vous" as a polite form of the 2nd person singular you must also match anything that depends on it to be in singular as well. The same goes for "vous" in the 2nd person plural. Vous vous êtes bien amusé? -- Did you enjoy yourself? (addressed at one person). Vous vous êtes bien amusés? -- Did you enjoy yourselves? (addressed to a group). Vous vous êtes bien amusées? -- Did you enjoy yourseves? (addressed to an all female group). Note that even in English you would use "yourself" if "you" stood for a single person and "yourselves" in case of a group of persons. Not so much different than French, eh? Sometimes it's a matter of context and if don't have all the information, you may not know. For example "Je vous vois". You don't know if I see one or more than one person. Without more information, you just don't know. And that's OK. Always look for clues such as plural adjectives. How do tell whether vous is singular or plural? Hi Pauline - if you mean in a kwiz question, then it should be either clear from the context of the french or english, or specified explicitly in the hint if not. If you mean in conversation, then it's usually evident from the context. Continuation Question on tense and gender. "the verb must agree with the gender and number of the person." Can you please explain the discrepancy between these two sources of information? Thanks. Alice s'est bien amusée. -- Alice had a lot of fun. The verb is "est", which is the third person singular and hence agrees with Alice, the subject. The verb always needs to agree with the subject of the sentence, no matter what. The participle in the example is "amusée". In the case of composite tenses which have être as their conjugated verb (as in this example), the participle needs to match the verb in number (singular) and gender (female), therfore you use "amusée". Jean et Marc, vous vous êtes bien amusés? Another example of the same kind: Jean et Marc are the subject in the second person plural and hence referred to as "vous". The verb (êtes) is matched to it. In the particular case of passeé composé with être as the conjugated verb, the participle needs to match the subject in gender and number: amusés. Another example, this time with avoir instead of être as the conjugated verb. J'ai mangé du pain. -- I ate some bread. Again, the verb "ai" is matched to the subject "je". The past participle "mangé", however, is not matched because the conjugated verb is avoir and not être. With this clarification you should be able to reconcile the two explanations. can you point to the contradiction you found, specificially? It would help me answer your question. Passé Composé. - what does Conversational past mean? conversational past is the tense you use in conversations when talking about some event that happened in the past. This is to be contrastet to passé simple which fulfills this function but not on a conversational level but on a literary level. The imparfait tense is different because it serves a different purpose and pertains to repeated or habitual actions in the past.